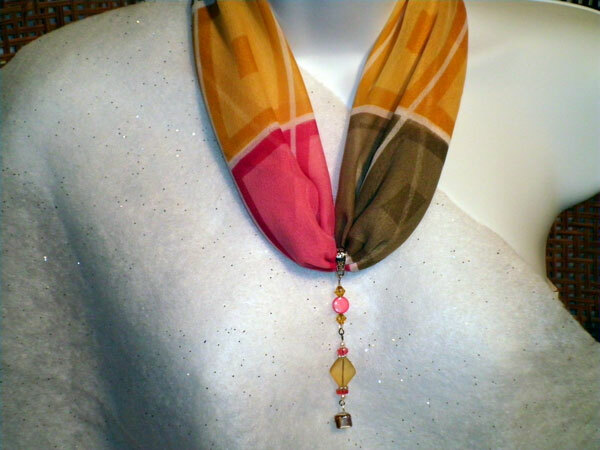 The scarf is 21 x 21 square with soft colors including 2 shades of golden yellow, 2 shades of watermelon, 2 shades of taupe and white in a diamond pattern. The dangle starts out with a melon colored button bead surrounded by golden glass bicones. The next section has a diamond-shaped yellow frosted glass bead with silver spacers, tiny white pearl beads and acrylic melon spacers. The final dangle is a beautiful Mother of Pearl chip in the same taupe tones as the scarf. I've included over 30" of sheer gold ribbon that can be used to hold the pendant if you want to wear the scarf and jewelry piece separately. It can also be put onto any silver chain that you already own for an entirely different look.